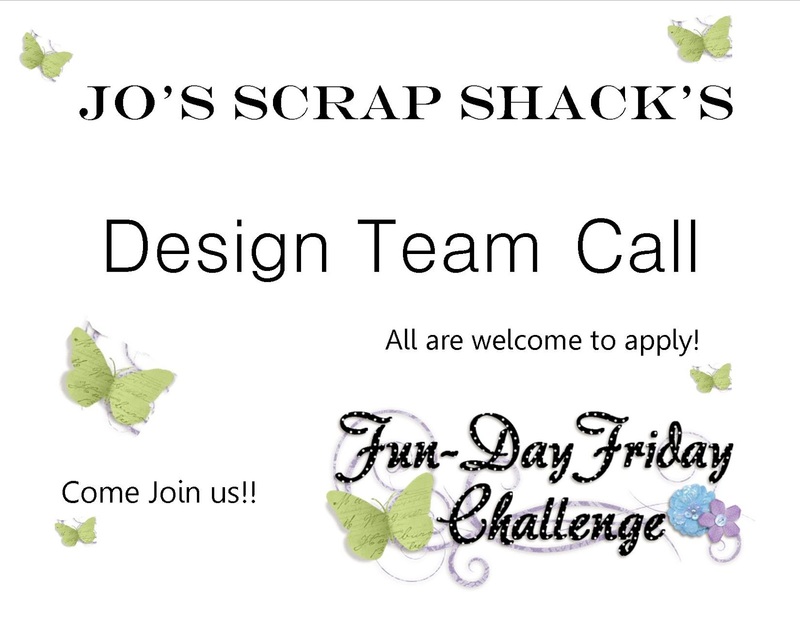 ~Jo's Scrap Shack~: Still time to apply for our 2018 DT CALL! Still time to apply for our 2018 DT CALL! Well the time has come once again! I am looking to add at least 4 new designers to the awesome team that I am proud to work with every week. Most of the designers on my team have been with me for 2 & 3 years now and we have formed a little family. There is nothing as precious as the friendships we form in this industry. You do not need any prior DT Experience! then here is what I want you to do. TRY OUT!! Yes GUYS are welcome!! 2. You will need to create 2 projects per month. During special occasions and blog hops, you may be required to do an extra project or two for that month. May is our blogaversary Month. You will be required to create a project and participant for that. 3. You will need to advertise on social media for all upcoming challenges, blog hops and guest design spotlights when asked. 5. The term will be for 6 months and will run from February 9, 2018 to July 6, 2018. At the end of the 6 month term, you will have the opportunity to stay on should you choose to. If you do plan to leave after your six months, I need a heads up at least one month prior to your term's end. 1. You will receive an array of digital stamps and cut files from many different companies in the industry. 3. You will receive an organized Yahoo Group to find all challenge information, links, sponsor information & friendly chat with your DT sisters/brothers. 2. Your project should be a reflection of who you are and what your style is. That is what I am looking for, personality and style. If you are great at creating shabby chic, then submit shabby chic and so on. Show me what makes YOU stand out. What is your passion???? Once I choose the DT members, I will notify you by email so please make sure that you give me a current email address in your submission. I will announce the 2018 (1st half) Design Team on February 2nd. The new DT girls/guys will start their term on February 9th, 2018.